Last month iRecruit participated in HR.com’s webinar series The State of Applicant Tracking Systems. We discussed how you can communicate the value of an applicant tracking system when you are in the market to purchase one. 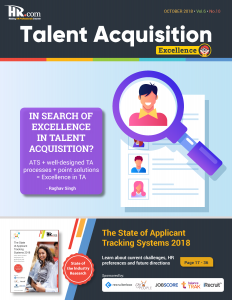 In addition iRecruit’s featured research is included in the October 2018 edition of HR.com’s Talent Acquisition Excellence magazine with the article Keys To The Successful Adoption Of A New Applicant Tracking System. In the article we provide 5 things to know when you are setting up a new system successfully. Making a business case to your senior management to make a large purchase can sometimes be intimidating. 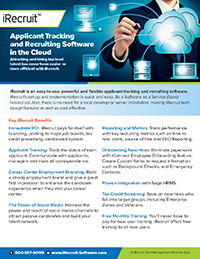 You know you’d love to add an applicant tracking system (ATS) to your HR strategy. How do you demonstrate the value of such a purchase to someone who does not see the day-to-day minutia of your time consuming HR tasks like posting jobs to different job boards, or communicating with candidates? This entry was posted in Blog, iRecruit Blog and tagged hr.com, talent acquisition. Bookmark the permalink.